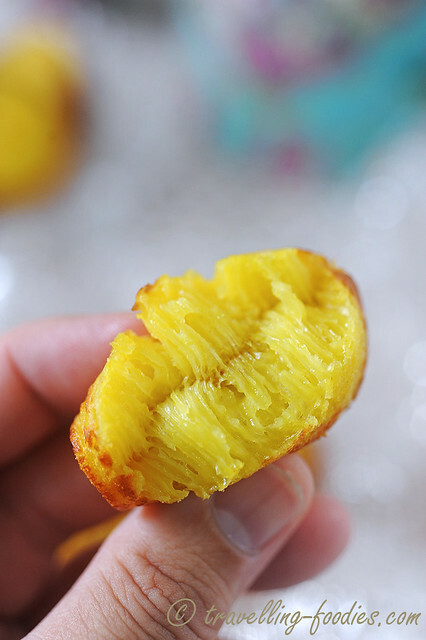 Bika Ambon is a very popular “kue” from Indonesia, the name seeming to suggest its origins from Kota Ambon in Maluku, or better known as the Maloccas Islands in the past. However, its popularity stems not from Ambon but in Medan, several thousand miles away in Northern Sumatra, where very good kek lapis can also be found incidentally. It was postulated by some that the confection was brought by Ambonese traders to Medan where it became viral, so much so that there is now a whole stretch along a street in the heart of the city, Jalan Mojopahit with no less than 30 stores dedicated to the sale of Bika Ambon amongst other popular delectables. Others explained that the name of the kue takes after a local bakery located at an intersection of Jalan Ambon and Jalan Sei Kera, located about two miles away from Jalan Mojopahit, where the first Bika Ambon was supposed to have been made, sold and popularised. We are not food historians so we ain’t gonna dwell too much over its beginnings, since it doesn’t add much to its flavours anyway, but what we do know is that despite its origins in Indonesia, its popularity has since overwhelmed its borders and traveled all over the world. It is known in Malaysia as Bingka Ambon or Kueh Ambon while some folks in the Peranakan community resonate to the name “Kueh Bengkah Sarang”. Whichever way it is being called, Binka Ambon by any other name would taste as good, just as a rose would smell as sweet. Traditionally, Binka Ambon is baked in a heavy copper or brass mould over charcoal flame, just like how many traditional kuehs were being made. One could bake in a mould with small cavities and serve as individual portions, more dainty and bitesize. Otherwise, it can also be baked in a larger mould and the final product is cut before serving. I prefer the first method for several reasons. Firstly, it is more “senonoh” to enjoy and more pragmatically, one could make and test taste at the same time, making small adjustments to the batter consistency if necessary. 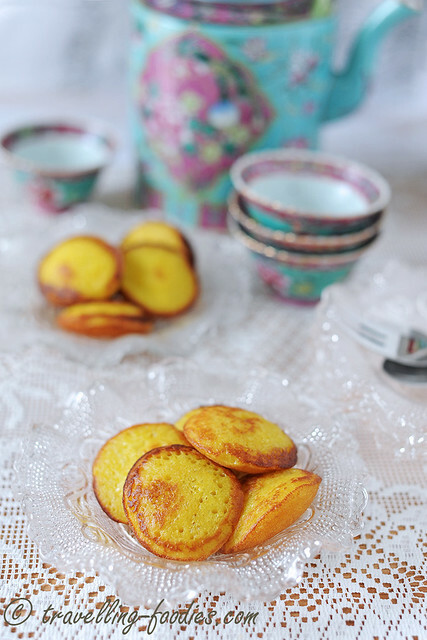 The individual small cakes also often yield a softer and fluffier texture compared to one which is baked as an entity. The ingredients from a traditional recipe which I’d used are pretty much standard. All except for the active dry yeast used, which is obviously a modern modification. Traditionally, the “biang” which means “yeast starter” in Bahasa Indonesia, consists of tuak, an alcoholic concoction used as a primary mode of fermentation alongside coconut water which meant longer and a somewhat more unpredictable fermentation process, not unlike how apom berkuahs were made traditionally. Though the yolks I’d used were from corn-fed chicken eggs and were really orangey, tumeric powder （serbuk kunyit) was added to intensify the jaune hues for double measure. In retrospect, that may have been unnecessary but at least we know that it is safe for the palate, unlike some commercial ones where artificial colouring might have been incorporated. 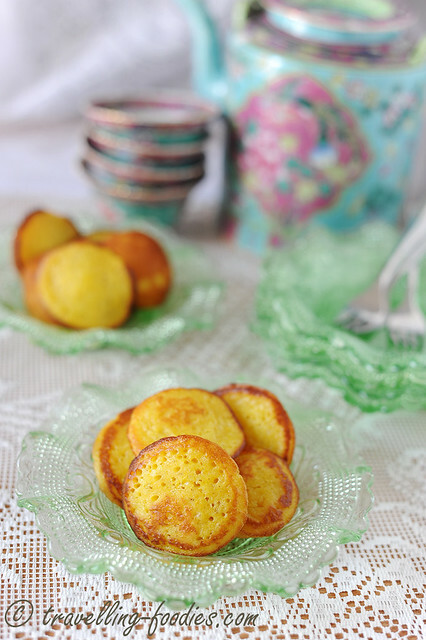 Traditionally, Bika Ambon is made with sago flour (tepong sagu) which lends that chewy and springy texture which makes the kue all the more enjoyable. There are folks who do partial or complete substitution with tapioca flour (tepong ubi kayu) but it is entirely up to individual preference. I stuck to the traditions by going with all tepong sagu though I have friends who shared that the incorporation of tepong ubi kayu may help to yield a more pronounced chewy texture. Apart from pandan leaves which lend their characteristic aroma in this “kue“, kaffir lime leaves (daun limau purut/daon limoh purot) otherwise known in Bahasa Indonesia as “daun jeruk purut” are also used alongside lemongrass aka serai/seray to hype up the aromatics. 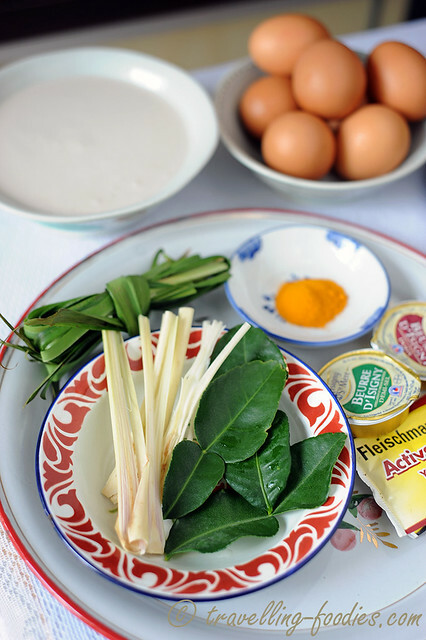 One can choose to leave out the lemongrass and kaffir lime leaves, and increase the pandan leaves of course. But I particularly love the aroma of kaffir lime leaves and use it whenever possible in my cooking! The actual time required for fermentation varies very much with the enzymatic activity of the yeast as well as the ambient temperature. 2 hours is the rule of thumb for me in hot and humid tropical Singapore. The longer the fermentation, the more bubbly the batter would become yes but at the same time, the taste of the bika ambon would also change considerably, with a more apparent bitterness from the prolonged alcoholic fermentation that kicked in, not to mention a more prominent “yeasty” smell which ain’t exactly pleasant for me. Also, the kue would taste somewhat less sweet as more sugar would have been used and converted into ethanol during the anaerobic respiration of the yeast. That said, under doing the fermentation process and the yeast would not be given sufficient time to do its work. So it is all about balance, which can be rather tricky. I’d done both methods for making Bika Ambon, i.e. 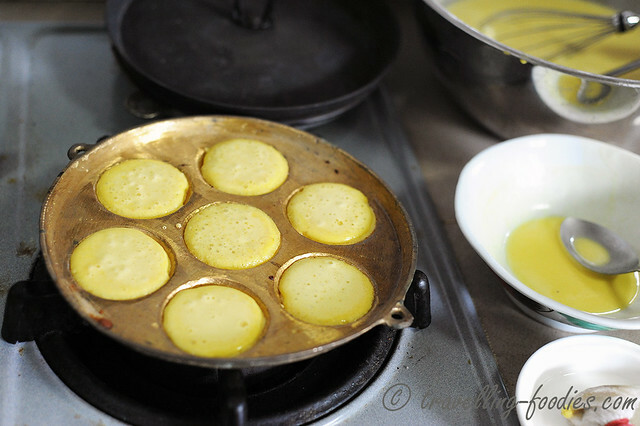 to “bakar” it over the stove (no charcoal stove though) as well as to bake a portion of the batter in the oven. Both turned out reasonably well but I much preferred the “over-the-stove-acuan” method. I used a copper mould which I’d gotten, thinking initially I could use it for making apom berkuah but the cavities were too dainty and deep for those rice cakes. Thankfully, they worked well for Bika Ambon. Otherwise, I would imagine a mould for kuih bahulu/kueh baulu/kueh bolu would work beautifully as well! 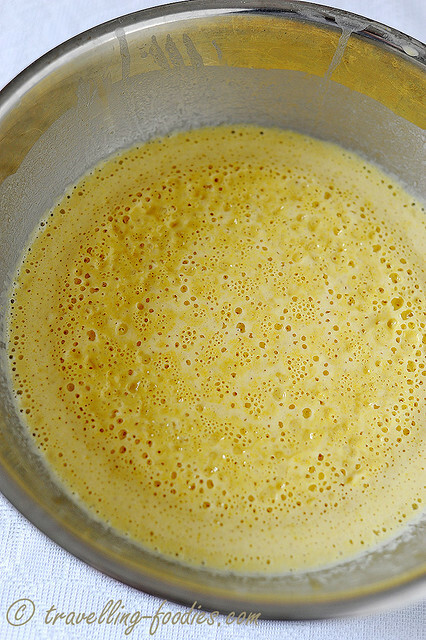 The batter after its final stages of fermentation is gently streamed into each cavity, starting from those along the sides, before pouring finally into the one in the centre. 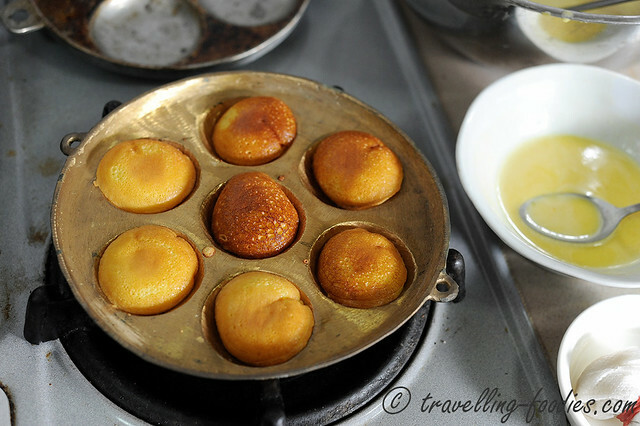 Common sense tells us why as the heat distribution would have been more intense in the middle thus compensated by the shorter cooking time so that all the kue would nicely cook all in the same time. 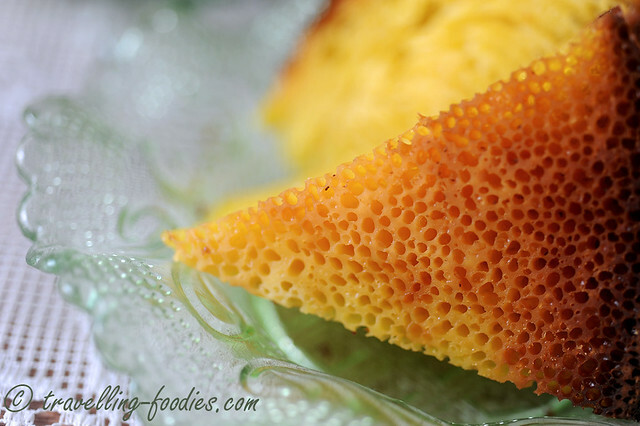 After a while, the batter would begin to rise and fill itself to be brim of the cavities, a good sign that the yeast has done its work and the carbon dioxide produced during fermentation has nicely engorged each kue through thermal expansion, tunnelling through the baking batter, creating the lovely honeycomb effect Bika Ambon is much coveted for. Some Peranakans call this “kueh bengkah sarang” for the tunnelling effect not unlike those which one would find in an ant’s nest. After a good few minutes, each Bika Ambon is flipped over to briefly grill the other side. Kuehs which have undertaken the process of “bakar” or “panggang” will and should develop an alluring aroma from the caramelisation of the sugars. The lovely browning from the maillard reaction is always a very reassuring sight of something highly palatable to come. I had a go making Bika Ambon with my trusty Apom Berkuah mould as well but given how shallow the cavities are, the results ain’t as gratifying as the copper mould with deeper cavities. As I’d mentioned earlier, kueh bahulu moulds should work reasonably well, particularly those with larger cavities. 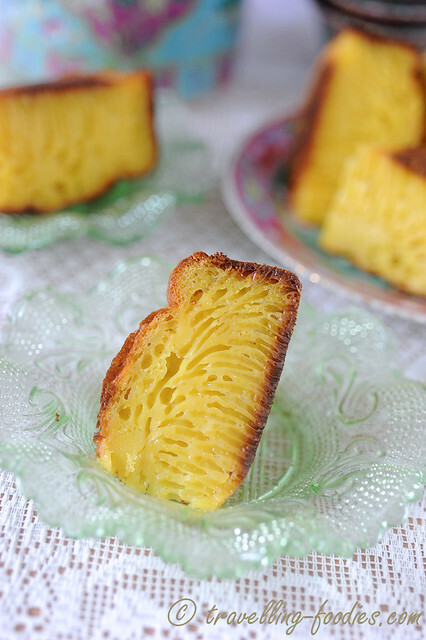 And of course the unmistakable “honeycomb” like structures that reveal themselves when a bitesize morsel of Bika Ambon is being pried into halves. It takes a bit of effort to get the batter right but given some practice, I think everyone should be able to make Bika Ambon without much hiccups. I think watchful experimentation is important for this kue just as it was with Apom Berkuah, to know exactly when the fermentation process has completed without overdoing it. First prepare the coconut cream mixture, by pouring the coconut cream, salt and sugar into a deep saucepot. Shred the pandan leaves lengthwise and tie into a bundle. Cut the lemongrass lengthwise and bruise with the back of the knife, followed by slicing the lemongrass diagonally. The treatment for the pandan leaves, kaffir lime leaves and lemongrass helps to release more aroma and flavours from these ingredients. Add the above ingredients into the coconut cream mixture and heat gently over low flame with constant stirring until around 70°C or when small bubbles begin to form around the perimeter of the saucepot. Turn off the flame, stir in the cold butter and leave the mixture to steep covered for about 30 min. After that strain to remove the pandan leaves, lemongrass, kaffir lime leaves. Set aside for later use. While waiting for the coconut cream to steep, prepare the “biang“, mix all the “biang” ingredients until well incorporated into a slurry. Cover with a plate and set aside for around 20-30 min for the yeast to be activated. 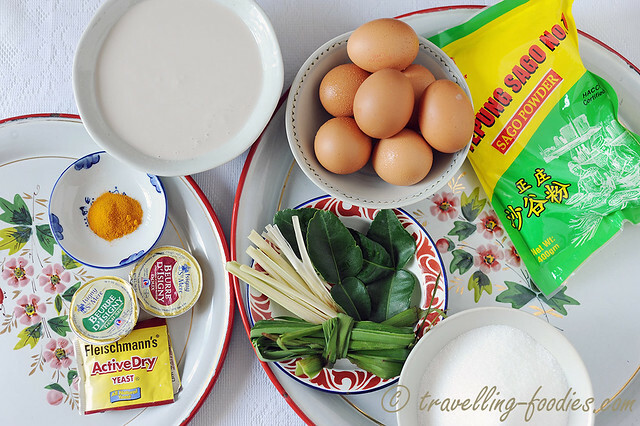 While waiting for the biang to activate and coconut cream mixture to steep and cool down, prepare the other ingredients. Place all the egg yolks, whole eggs and 100g of granulated sugar in a mixing bowl and whisk until the mixture turns pale and fluffy. Add in the sago flour and mix well with the whisk to get ride of any flour lumps. The tumeric powder should be added now with the sago flour if using. Stream in the coconut cream mixture in small quantities very gradually into the egg and flour mixture with constantly whisking to temper the eggs. Since the coconut cream was only heated only to around 70°C, the eggs should not curdle from the heat but mix well anyway to prevent that from happening. Continue to whisk the final mixture until the temperature drops to around 40°C. The batter should be very slightly lukewarm to touch. Finally, add in the activated “biang” mixture and stir well to incorporate. Cover with a large plate or damp towel, and leave the mixture to ferment for about 2 hours. 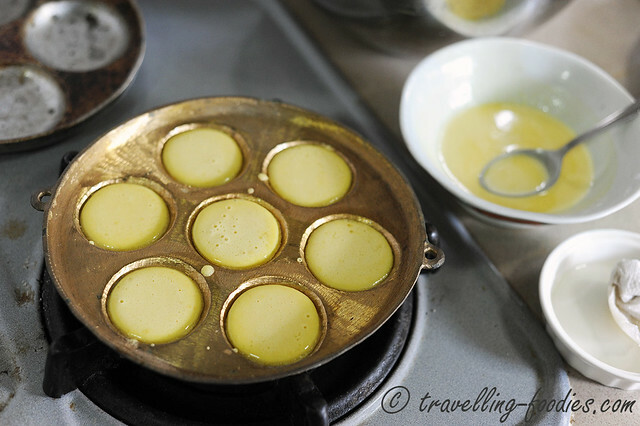 To prepare individual servings of Binka Ambon with a mould, heat the moulds first over the stove on very low flame for a while and lightly grease the cavities. Take care to wipe away any remnant oil that collects at the bottom of each cavity. 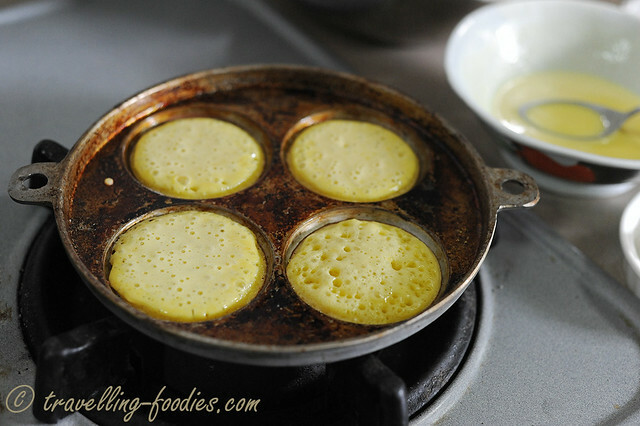 Carefully pour the batter into each cavity until they are four-fifths full. Cover the mould with a heated lid for about 1-2 min when the batter rises to the brim and small holes begin to form on the surface of each portion of kue. With the aid of a toothpick, carefully flip over each piece of Binka Ambon and grill the other side until the surface browns slightly. Remove and repeat with the next batch until all the batter is used up. Take note to stir the bottom of the mixing bowl periodically to prevent the sago flour from settling at the bottom. To prepare Bika Ambon by the baking method, first preheat the oven to 200°C with BOTTOM HEATING ELEMENT ONLY for about 10-15 min. With a balloon whisk, carefully stir the bottom of the mixing bowl after fermentation to dislodge the sago flour which had settled at the bottom. Pour the fermented batter into a 10″ round baking tin which had been lined with baking parchment beforehand. Lower the temperature to 170°C and bake in the preheated oven for about 1 hour, opening the oven door very briefly every 15 min or so to release accumulated steam and excess heat. Finally turn up the temperature to 200°C, as well as the TOP HEAT ELEMENT and grill the surface until the desired browning effect is achieved. Maintain a watchful eye over the Binka Ambon over the last 15-20 min of the baking to avoid burning the surface. Carefully remove the kue from the baking tin onto a wire rack until it has cooled down sufficiently for it to be sliced into pieces before serving. This entry was posted on April 14, 2015 by Alan (travellingfoodies). It was filed under Food, Simple Eats and was tagged with acuan, apom berkuah, bengka ambon, Bingka Ambon, binka ambon, cakes, coconut cream, coconut water, confections, daon limoh purot, daon pandan, daun limau purut, daun pandan, fermentation, honeycomb cake, indonesian kueh, kueh ambon, kueh bengkah sarang, kuih ambon, lemongrass, pandan leaves, ragi, sagu flour, santan pati, santan pekat, serai, seray, snacks, tapioca flour, tepong sago, tepong ubi kayu, toddy, yeast. Would appreciate that you can tell me where to buy this over-the-stove-acuan which you use to bake Anika Ambo.. I have searching for this stove v long.. Thank! I got it through a friend. Not sure where she got it though… you can try Bangkok. 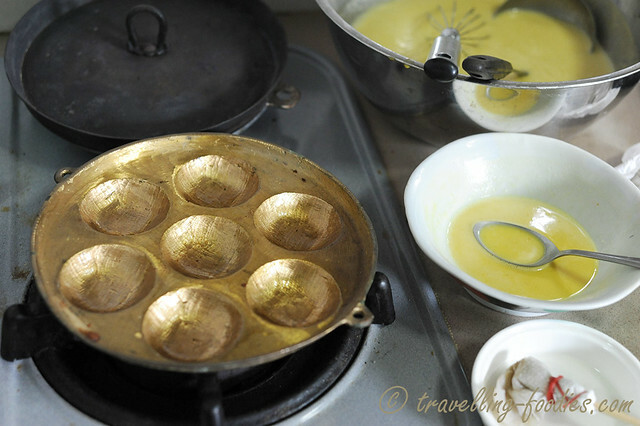 The Thais use quite a number of moulds for making desserts similar to what we use over here.